I accepted with the condition that I could be completely honest with my review including all the pros and cons. Now that I’ve reviewed it I’m giving it away to one of my guest writers to thank them for all the articles they’ve written for my blogs. Anyway… onto the Sony Ericsson c902. As you can see in the photos below its has a standard size for a “candy bar” shaped phone but its thinner and feels nice and solid because its case is largely made of metal. This device is a great example of Device Convergence because it continues the trend of cramming more and more technologies and features into 1 product eg: Audio & Video Phone calls, SMS, Calendar/Scheduling, Games, Music Player, Radio, Internet access, Camera for Photos/Video recording and Local data transfer (Bluetooth). The end result is an ability to do things which were never possible a few years ago eg: Live Photo Blogging the 14km City2Surf fun run and taking lots of other photos and videos along the City2Surf course to create a slide-show to publish later on the internet. The main strength of the c902 is its 5 megapixel camera with touch screen menu buttons and an innovative slide out cover. If I was going on holiday I would of course take my semi-professional serious camera gear but for most other purposes eg: taking photos at a party, while commuting etc the Sony Ericsson c902 Camera Phone would be quite sufficient and always be at hand in your pocket for a quick grab shot of something interesting you’ve spotted. I’m very fast at typing SMS on my Nokia 6300 and I send a lot of them so I got frustrated by the keys on the c902 which are smaller, more smooth and slippery than the 6300 keys so my typing speed was slowed down appreciably while testing the c902. For most people this probably won’t be a problem but it was for me because I’m tall (6ft 3″) with proportionately larger feet, hands and fingers than average. 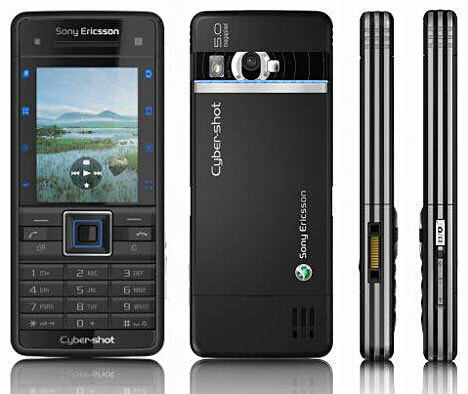 I have read the best reviews of the Sony Ericsson c902 and many user comments/feedback about it and created a list of the Best features, Annoying Problems, Tips & Tricks to customise the phone to suit your needs. 3G HSDPA high-speed Internet – The third generation of mobile networks brings the convenience of broadband Internet to your mobile phone. Fast data transfer speeds – up to 3.6Mbit – give you quick, easy access to a world of audio and video streaming, Web surfing, multimedia messaging and email wherever you go. Accelerometer – Enjoy your pictures in portrait or landscape mode. To move between modes, simply rotate the phone and the picture automatically auto-rotates on screen. This also works when web browsing on the internet. 5 alarm options – can use photo image as well. Calendar has separate colours for weekends – Saturday and Sunday. Month view is quite good, similar to MS Outlook. It’s possible to sync your calendar and various other data via either SyncML or Microsoft Exchange ActiveSync. You can use the cable included in the phone package to connect your phone to your computer via USB. You can then access your phone like a removable USB drive – downloading photos straight from the 160mb internal memory and also easily adding custom ringtones, games, wallpaper. 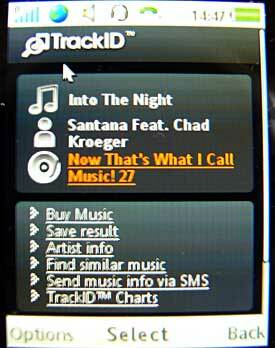 TrackID is one of the coolest features about this phone and lots of other Sony Ericsson’s latest phones. TrackID is a brilliant free feature (although it will obviously use some of your mobile internet data plan). When you’re listening to radio it records a small section of the song, uploads it to a special server and after a few seconds you’ll be redirected to a website with the song information (if the song you recorded was in Gracenote’s music database). The service is quite accurate for most popular music. BestPic™ feature – Take 9 pictures in one second & Pick the best one. Auto focus – noticeably improves image sharpness & clarity compared to camera phones with fixed focus. 5 Megapixel camera that can also take video. Have a look at these examples of photos taken with the Sony Ericsson c902 camera phone to see what it’s capable of. WALLPAPER: – You can get over 48000 FREE 240×320 wallpapers from Mobile9.com – I use the Voyage 2 Nature wallpaper. RINGTONES: Don’t bother buying ringtones because the Sony Ericsson c902 supports MP3 ringtones which you can add to the phone when you connect it to your computer via the USB cable. I use the TV theme for Doctor Who as my Phonecall ringtone. The plastic screen protector which is shipped with the phone should be split between the slide out camera top and screen area. Otherwise it’s impossible to open the slide out camera. I’ve heard from quite a few people who had the same problem. Battery warning at few % left and at 0% it just switches off by itself with no sound warning. If you try and turn it on again there’s no response. On most Nokia’s it would turn on for a few seconds, say “Low battery” and then turn off. Mobile phones have continued to evolve far beyond being a simple telephone, and the C902 is the latest in this line of development. I have more than the means to simply phone or text home to say I’m running late, sitting comfortably and unobtrusively, in my shirt pocket. Kewl features on this C902, little ones, but its the little ones that count : The FM radio is great – It has really good reception on the Mornington Peninsula which even proper dedicated $300 boomboxes dont get… and u can minimize the radio and do other phone stuff and just let it play. Either thru headphones, which u can also bluetooth phone on, or a speaker which I have the TripleJ Friday Night FunkTrain kranking on. A very comprehensive review here Neerav. I agree about the slippery little keys. I too am thinking of giving mine away because I’m locked into a contract with my current phone/provider. So are you giving yours away without a SIM card? This is a great read, Neerav! It’s extremely thorough, and your opinions are honest and very comprehensive, meaning this is great feedback for us to take on – most useful. Many thanks. Loved this phone to start with but now it constantly freezes then switches itself off, vodafone wont help me, ive not got insurance so they dont want to know, help! I have the Sony Ericsson W800i and looking to upgrade. I might consider the c902. If you notice the charger plug, it actually has a socket on top of it so you can plug in the headphones on top of the charger. Thats what its like with mine and most other new SE’s…. EDITOR: Elie you are quite correct, now that you mention it I can see the extra socket on top of the charger. I like the specifications of this mobile like Capture life’s spontaneous moments and share them with your friends and family. Slim and stylish, with 5.0 megapixels, and touch screen camera keys, this phone looks as stunning as the shots it takes. With my k750i I was able to charge the phone by connecting it with the USB cable to the computer. (This was ideal for travelling, as i only had to bring the USB cable rather than a bulky three-pin plug charger.) It seems that i cannot do this with the C902 – to charge the phone i have to use the dedicated charger. I am hoping i am wrong about this. Has anyone been able to charge their c902 using ONLY the USB cable??? Yep, all Sony ericsson phones support USB charging, I have a W890 and I can confirm that. However, you must note that all recent SE phones have quite large battery capacities and take long to charge, unlike earlier phones. Hope this helps! Excellent write-up Neerav, and thanks for mentioning my review. It’s kind of funny, but ever since reading your comment about the phone charger one of the plastic prongs stays plugged into the phone when I unplug the charger. It’s annoying because it’s a task and half to pull it out of the phone again. Hi Neerav! Thanks for a very detailed review. My husband’s phone is Sony Ericsson but mine’s not. At first, I find Sony Ericsson difficult to use, but after some time, I got used to it. This phone is great; and with 5.0 megapixels, it’s amazing! Thanks for the great review Neerav! I’m already convinced to switched to Sony Ericsson. Hi, is there a way to put the Time and date on pictures taken by C902 , just like K800i. I loved this phone when i first got it but since then mine has been back 3 times because of freezing and sceen pixelating and no sound and it has recently been replaced with a brabd new one and the bluetooth doesn’t work…….so i have just had bad luck i guess. I disagree re charging solely via USB lead. This will only work if the PC has the required/necessary software installed, or is in the mass storage mode. If in this mode, most phone functions are disabled. I’ve also tried a seperate USB charger for use in a vehicle 12V aux socket, and this does not work either. This situation has been confirmed by Sony Ericsson UK support. It certainly takes away some flexibility from an otherwise good phone. i can charge my C902 through my pc by using the suppiled usb cable and the media transfer setting!